Football fans share all manner of interests outside of the beautiful game. Some of them like to take on the dealer in blackjack or roulette, while others might prefer to tackle opponents directly at online poker tables. Here at Gambipedia.com, you can also receive helpful advice in order to sharpen your online poker experience. Starting from this point, you will be presented with a handpicked selection of the top poker sites in the world. From this section, you will also have access to a specially commissioned range of online poker strategy guides. There is a wealth of information out there to improve your strategy, so why not check out a guide or two? Intertops Poker is another destination where you can use your first deposit to unlock even more funds to add into your bankroll. By making a minimum deposit of $25 or more, Intertops Poker will super-charge your stake with a 200% bonus boost. For the most ambitious players, they will be able to deposit $500 and unlock up to $1,000 worth of bonus funds, making the Intertops Poker offer one of the largest of its kind. Intertops is also known for operating a casino site, which is why the welcome offer will also deliver 100 free lines on casino games. At a glance, the terms and conditions reveal some crucial requirements. The first is that you must submit the bonus code “1000ITP” or else the welcome offer will not be activated on your initial deposit. The second is that your funds will be awarded in $5 increments by completing Frequent Player Point Demands (FPPs). For reference, it will require 83.335 FPP in order to release the $5 increments to your account. You can read the terms and conditions for full details. 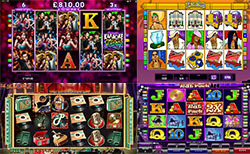 Intertops will give you the choice of accessing games instantly in browsers or else from the downloadable poker interface. All of the upcoming poker tournaments are displayed throughout the day, with an array of buy-ins and prize funds to play for. Intertops is also well-known for hosting special promotional tournaments. These can often let online players complete for the prize of attending real-life poker tournaments alongside famous professionals. Then, there are on-going tournaments like Sunday Six Max.